Henry Coe is by far the largest park listed on this website and one of the remotest. While not all of it is open to mountain biking, its more than 130 square miles of total land area easily dwarfs any individual city around the Bay Area (like San Francisco, at 49 square miles) with the notable exception of San Jose. It features plenty of excellent bike-legal singletrack, though it'll frequently make you work hard to get to it: its fire roads are notorious for steepness. One other thing Henry Coe is known for is the (seasonal) prevalence of ticks. So, before you ride here during tick season, you might want to educate yourself a little bit on the kinds of places where ticks may be found, what time of year they're most active, what's their behavior once they get on you, etc. Also, frequent stops during your ride to look for ticks on your body is highly recommended, and it couldn't hurt to wear bug repellent (though I wouldn't rely solely on that). The trails I've tried at Henry Coe have always been well marked. That's a good thing, given the remoteness of its location, since you can't exactly say "if I get lost, I'll just keep going until I hit one of the surrounding neighborhoods". Still, I wouldn't rely solely on trail signs for navigation at Coe (or anywhere, for that matter). If you are making a crucial navigation decision for your ride, be sure to have some backup verification of it (map, GPS, etc.). In order to save yourself some embarrasment if not trouble, you should keep in mind that all singletrack trails are automatically considered closed to bikes for 48 hours any time there is at least half an inch of rainfall at the park's headquarters. Finally, due to its inland location, the weather at Coe during summer months can get much hotter and drier than many other riding locations around the Bay Area. When you also consider its remoteness, the importance of coming prepared with extra reserves of water goes without saying, and planning your riding range carefully during the hotter months would be wise. This ride route begins from a spot that I can no longer recommend for parking. At the time of this ride, parking at the Coyote Creek Gate as shown here was arguably acceptable practice. Since then, however, the park staff has established the practice of consistently ticketing any cars parked in one of the handful of spaces available around this gate. So, what I would recommend to anyone for this ride is the only way I would do it right now myself: park at and start from the Hunting Hollow parking lot instead. This is the suggested parking spot I point out for the "Henry Coe (Jackson and Dexter Trails)" ride as well and, as done on that ride, this will add four miles to your round trip (as well as a fee for parking, which was $6 as of 2017) but shouldn't increase your total elevation gain by much more than 200 feet. That road segment is mostly flat. While you start the ride on Spike Jones Trail (right after a brief stretch on Coit Road), the route temporarily leaves that trail and follows the more minor Timm Trail on the way up. Timm Trail is still a climb, and often a strenuous one, but at least it's broken a couple of times by flat segments, as well as being a twisty and pretty singletrack. The climb becomes more steady once you merge back onto Spike Jones Trail. The slope of this climb is serious and relentless at an average 11% grade for the entire reminder of the portion on Spike Jones Trail, but at least its difficulty level doesn't reach the ridiculous territory. Still, the second half of this stretch actually gets a bit worse and averages 13% grade, with plenty of spots that momentarily exceed that figure by quite a bit, naturally. When you reach Steer Ridge Road at the top of this climb, you find yourself on a wide fire road. While the climb doesn't immediately stop at this point (you have almost another quarter mile to go before it does), many distant views do immediately open up to you. The part of the ride on this ridgetop is its most scenic portion, from which you can spot Lick Observatory on Mount Hamilton and even glimpse parts of Hollister if you know which direction to look in. Soon after you pass very close to Willson Peak and start a mild descent, the route turns onto Serpentine Trail, which marks your return to singletrack. It's therefore very welcome, though this is a pretty steep trail in a few spots. While it's not technical, I've still found it to be quite a lot of fun. At the bottom of the valley, Serpentine Trail ends at Grizzly Gulch Trail. This trail starts like a fire road but almost immediately reverts to being a singletrack and effectively stays that way until the end of the ride. 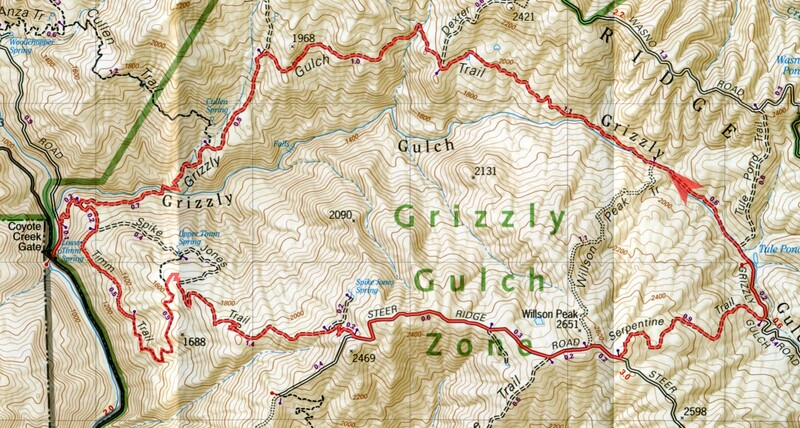 Grizzly Gulch very closely follows a creek bed for the first mile or so that you cover on this trail. It passes through very cute and cozy settings and offers more technical fun compared to what you've had so far on the ride, mainly thanks to the numerous rocky stream crossings along this stretch (which are likely to contain water only seasonally). There's a point where Grizzly Gulch trail undergoes a character change by leaving the creek bed behind and starting to gain elevation to become a hillside singletrack across grassy slopes. This "climb" is not serious enough to feel like much work and doesn't last long either. Grizzly Gulch Trail then continues flatly on average with minor ups and downs for maybe a mile before it undergoes a jekyll-to-hyde transformation once again and starts a steep dive back toward the creek bed. The first half of this one-mile descent is its steeper part, at an average grade of at least -18%. There are a couple of stretches along this descent that deserve some extra caution. When you encounter another couple of stream crossings, it's a sign that you're almost at the end of the ride. There is about a quarter mile of gentle uphill pedaling under tree cover past those crossings, after which you quickly connect back to the beginning of the loop and finish the ride. This ride route might deserve to be classified as moderately shady as far as Henry Coe rides go. While the shade is broken and mostly restricted to the first two miles of the route and to portions of Grizzly Gulch Trail (mainly around its first and its last mile), that's not bad if you need to endure the summer heat for a ride at Coe.